Developed to exceed the National Cancer Institute's Expectations… and Yours. 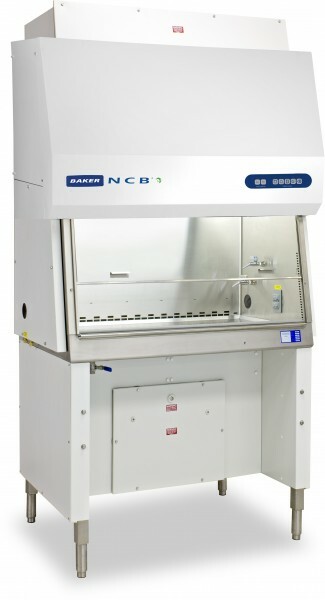 The Baker NCB™ e3 biological safety cabinet exceeds specifications for the NCI-1 cabinet developed by the National Cancer Institute, with unique design features proven to enhance containment while inhibiting cross contamination and exposure to chemicals, vapors and gases. Patented under the work surface, HEPA filters and the direct exhaust airflow system combined, increases protection from particulates, preventing the buildup of chemical vapors and gases. All exhaust air is removed directly from the work area (direct exhaust) into a building's separate exhaust system. Vapors and gases emitted from vessels or work behind the air split (approximately halfway back from the cabinet front) are removed and not recirculated. HEPA filters located below the work surface assure that all positive pressure areas are free of particulate contamination. Additionally, all positive pressure plenums are completely surrounded by negative pressure. Recirculated air is HEPA-filtered immediately below the work surface before it is passed through a supply downflow filter above the work area. The NCB™ e3 utilizes StediFLOW™, a self-adjusting motor technology that requires less energy, extends filter life, and reduces heat output to the lab without sacrificing performance.